During her lifetime, Katherine Parr was a truly remarkable woman; and yet in death she is also unique in that she is the only English queen to be buried on private land. She lies at peace within the heart of the chapel at Sudeley Castle, in Gloucestershire, itself embraced by the lush slopes of the surrounding Cotswold hills. However, her repose has not always been so peaceful. Her grave was opened on numerous occasions and horrifyingly, her body even taken out and dumped on a rubbish heap for all to see! Want to find out what happened to this remarkable woman after she died in 1548? Then a visit to the house and chapel is a must for any Tudor time-traveller, so significant, and well documented, are the events that took place there. An aerial view of Sudeley Castle showing the beautiful surrounding Cotswold countryside. Life had been a whirlwind for Katherine Parr since the death of the mighty King Henry VIII, her third husband, in January 1547. Castigated for the untimely speed of her remarriage to her true love, Thomas Seymour; surrounded by the controversy of her brother’s contentious marital situation, and embroiled in the dubious dalliance between the young Princess Elizabeth and her new husband, the 36-year old queen, now in her sixth month of pregnancy, must have longed for a little respite as she prepared for the delivery of her first child. Sudeley Castle, in the beautiful Cotswold countryside, would provide that respite. It would be the couple’s retreat for the final three months of Katherine’s pregnancy and, as it would turn out, her life. With an entourage fit for a queen, on Wednesday 13 June, Katherine set out to travel the ninety or so miles north-west from her manor of Hanworth to Thomas Seymour’s newly refurbished castle at Sudeley. Even today, with all the encroachments of modern living, Sudeley Castle feels both isolated and idyllic. Thus, 500 years ago, it must have seemed even more so – a perfect balm for a weary soul. We should remember that during her 36 years, Katherine had lived an extraordinarily full life. Even the woman who, as a child, is said to have received a prophecy that ‘crowns, not needles, were her future’ could not have foreseen how events would unfold. Katherine had been married four times; as a young wife and step-mother, she had been held hostage during the Pilgrimage of Grace by an angry crowd, whilst living in the family home at Snape Castle in North Yorkshire; she had been touched by the scandal relating to her brother’s disastrous marriage, and had given up the love of her life to ‘do her duty’ and marry an ailing and cantankerous king; as queen, Katherine had almost ended up in the Tower being accused of heresy, having come close to being implicated by her enemies as being involved with the Anne Askew affair. (The latter ultimately being burnt at the stake as a heretic). Finally, the dowager queen had found herself in conflict with Protector Somerset over her marriage to Thomas and Somerset’s refusal to deliver to her the queen’s jewels, which Katherine believed by right to still be hers – after all there was still no other queen in England! With all that behind her, Katherine and Thomas arrived at Sudeley Castle in June 1548; the dowager queen had her ladies at her side, along with Thomas’ young ward, Lady Jane Grey. During the Tudor era, Sudeley Castle was a large, double-courtyard manor house, hewn from honey-coloured Cotswold stone, as it still is today. The most opulent range, housing the privy apartments faced east, overlooking the stunning gardens. These had been laid out on a parterre, no doubt overflowing with sweet scented blooms during the summer months, and sited adjacent the castle’s chapel. A small, private oratory, built onto the side of the church, allowed Katherine to observe services in private. It was connected to her apartments by a covered walkway (both of these are now lost, although the walkway is marked out by a trellis running form the castle to the chapel). Katherine’s apartments are also almost entirely lost; the privy wing, originally built on the orders of Richard III, when he was Duke of Gloucester, was badly damaged during the English Civil War. What remained no doubt gradually crumbled through neglect and the passage of time. In order to see again the home Katherine knew, we must imagine that east range, rising up from the ground, two storeys high, with large, ornately carved windows lighting both courtyard and garden sides, flooding the lodgings with light. However, along with the hauntingly beautiful remains of Richard’s original state apartments, a fragment has survived intact in the form of a closet; a small room that was part of the ‘secret’ lodgings of any high status Tudor house. This first floor room was once part of Katherine’s chambers. 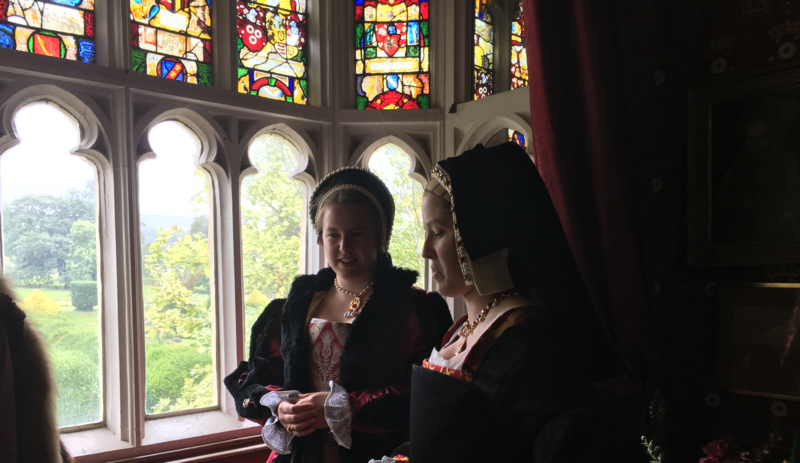 It is a wonderfully warm and intimate place, and easy to imagine a heavily pregnant Katherine reading with the young Jane Grey, or writing one of the letters she clearly penned during her time at Sudeley Castle. Part of the ruined east range – once home to the Sudeley Castle’s privy apartments and used by Katherine Parr. Notice the magnificent first floor lodgings. You can look out of that window, across the gardens and towards the chapel (originally on the far side of a moat), and feel Katherine’s presence by your side, or perhaps see the train of a gown disappearing behind one of the tall hedges framing the parterre in the gardens below. But for Katherine, the peaceful idyll would not last. Having been delivered of a girl, who the couple named, Mary, on 31st August, the dowager queen soon showed the deadly signs of the dreaded puerperal fever. Katherine lingered for 5 days as infection ravaged her body, causing multi-organ failure. She died in the early hours of Wednesday, 5th September. Her body was wrapped in cere cloth to embalm it – and as we shall hear shortly, this did a remarkably good job! In accordance with Katherine’s religious beliefs, she was buried in the chapel, within sight of the place she had died, in a religious ceremony which reflected Katherine’s ardent beliefs in the reformed faith; something that she had so zealously espoused during her life. The service was short and conducted in English. This was remarkable at the time, and is said to be the first Protestant burial of an English queen. And so, Katherine lay in her grave, encased in a lead coffin, embalmed in cere cloth and undisturbed as the seasons, then the years, came and went. Her husband went to his grave, executed for treason not many months after Katherine died; at some point her infant daughter disappeared from the records and, in time her siblings, friends and family also passed into dust. Nearly 100 years later, and the country is tearing itself apart in its Civil War between Royalist and Parliamentarian forces. Sudeley, on the side of the Royalist faction is slighted in 1643, and subsequently abandoned for around 200 years. The once beautiful castle begins to be taken over by the earth, as the walls crumble and ivy grows up around the ruins; the grounds are used for grazing livestock and once more there is an all pervasive peace. Agnes Strickland, a nineteenth century antiquarian, who detailed the lives of the Queens of England, gives a unique account of the rediscovery of Katherine’s body some 200 or so years later. Writing around 50 years after it was first rediscovered, i.e. within living memory, the detail, which is rarely recounted in full, is utterly fascinating! She writes that the queen’s body had originally been buried on the north side of the church, near the high altar, within the altar rails. Reading an account of this, in May 1782, a group of ‘lady sightseers’ arrive for a day trip, determined to examine the ruins of the chapel. We can only imagine the moment; making their way through rubble, exploring the derelict walls covered in brambles and ivy, one of them notices a ‘block of alabaster, fixed into the wall of the chapel’. They enlist help to dig below the panel and discover a lead coffin, buried not a foot beneath the ground. Driven by curiosity, they make two openings in the ‘leaden envelope’, which encases Katherine’s body; one over the face and another over the breast. They find that she was wrapped in layers of the cere cloth we have already mentioned. They are utterly shocked to discover that the queen’s face, ‘particularly the eyes, [are] in the most perfect state of preservation’. Can you imagine it? It is the find of all finds! However, they are unnerved by their discovery and the smell coming from the cloth, so they order earth to be thrown back immediately into the leaden coffin, without closing up the holes they had made. Nevertheless, they had seen enough of the inscription to convince them that it was Queen Katherine. In the same summer, a Mr John Lucas, said to be the person who rented the land on which the chapel stood, again removed the earth from the leaden coffin and ripped up the top of the coffin. He claimed that Katherine’s remains were ‘entire and uncorrupted’, and after making an incision in the layers of cere cloth covering one of the former queen’s arms, found that her flesh was still ‘moist and white’. Katherine Parr’s final resting place. Of course, exposure to the air began to accelerate the corpse’s decay. Katherine’s body was rescued and again reinterred, only to be exhumed once more in October 1786 for a formal autopsy. By this time, the face was totally decayed, and the teeth fallen out. The corpse was described as ‘perfect’, but out of ‘delicacy’ it was not uncovered. The report stated that: ‘The cerecloth consisted of many folds of linen, dripped in wax, tar and gums, and the lead [coffin] fitted exactly to the shape of the body’. It concluded that, ‘The queen must have been of low stature, as the lead that enclosed her body was just five feet four inches long’. For some while, the body lay buried under the floor of the abandoned ruined chapel, which was at one time (as reported by Strickland) used to keep rabbits which ‘make holes and scratch very irreverently around the royal corpse’! Agnes Strickland lamented the lack of a proper resting place and monument for the long-dead queen. Eventually, however, in 1817, Katherine’s remains were sealed in the stone vault of the Chandos family. Then, in the mid-nineteenth century, the architect George Gilbert Scott was employed to restore the chapel, which was completed and re-dedicated in 1863, some 20 years after Miss Strickland wrote her account. Scott designed a magnificent canopied tomb with a recumbent effigy of the queen, made of white marble, and carved by John Birnie Philip. A close up of the tomb of Katherine Parr. Sudeley Castle, the final home and resting place of Queen Katherine Parr is an enchanting place; the beauty of the parterre in summer, the still coolness of the chapel, the intimate warmth of Katherine’s private closet; all will stay with you long after you have left behind England’s only queen to buried in the grounds of a private house. And after a lifetime of drama, the ravages inflicted upon Sudeley by the later Civil War, and the desecration of her body after death, Katherine now rests ‘neath starry skies’, waiting for your return. If you want to read about Katherine’s childhood home of Rye House, in Hertfordshire, click here. If you wish to read more about the life of Katherine Parr, visit our friend at The Tudor Times, here. There are both refreshments, a shop and toilets on site at Sudeley, alongside a generous car park. However dogs are not allowed inside the grounds. So leave your pooch at home if you are planning a visit. Sudeley is also part of The Historic Houses Association. You might consider becoming a member if you plan to visit around 4/5 properties, (properties that are members of the scheme), in a year (or during our visit, if you are coming from overseas). Check out the website for listed houses to see if you might save money during your visit. For opening times, visit the Sudeley Castle website. Nearby, are the ruins of Hailes Abbey, site of the visitation made by Cromwell’s men during the 1535 progress, when Anne Boleyn stayed with Henry VIII at Sudeley Castle. It is a lovely spot to visit, particularly on a fine summer’s day. I recommend combining the two, if you have a car. Also, if you are also a fan of steam railways, you might consider catching a train from Winchcombe to Hailes via The Gloucestershire and Warwickshire Steam Railway (the railway is seasonal, so do check out their timetable). It’s a different era of time-travel but fun, nevertheless! I haven’t read about this castle in your book as yet but I definitely will now .Ian intrigued to learn more about her now also! I was aware katherine’s body was moved but not aware that she was desecrated so badly. Honestly, neither wasI until I researched this blog!